I recently had the opportunity to visit Paris for a week. 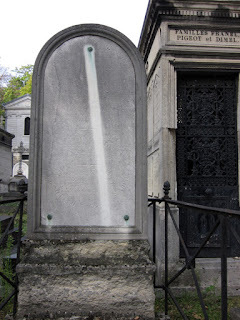 During my time there, I explored two famous places full of dead Parisians: Père Lachaise Cemetery and the Catacombes de Paris. While wandering about each of these sites, I happened across a cool microbial thing. Now, thanks to the power of digital photography and my ability to push a small button, I can share these things with y'all. The southern bank of the Seine (Left Bank) lies atop a bunch of high quality limestone, which was mined via underground tunnels to construct buildings throughout Paris. In the 18th century, graveyards of the city began to overflow (old city + growing city population + war + disease + famine = lots of dead folks), pushing officials to create several new, larger cemeteries (including Père Lachaise). They also decided to move the remains of six million people from existing graveyards to the now-abandoned mine tunnels. Although bones were initially just dumped wherever, a dude named Louis-Étienne Héricart de Thury decided it would be a good idea to organize things a bit. Femurs and skulls were stacked in interesting ways and various decorations were added. After a brief life as a hipster hangout for the aristocracy, the catacombs were gradually opened to the public. The site is now one of the municipal museums of Paris. I highly recommend a visit. 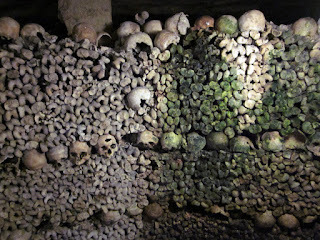 As I was walking through the catacombs, I noticed the occasional green stain. Upon closer inspection, I realized the green was likely due to photosynthetic organisms, as it appeared only in damp locations near where artificial lighting had been installed. In one spot, which I managed to snap a photo of, twin trails of green down a wall of bones marked a lamp-lit location where water was dripping from the ceiling. Based on a brief dig through the scientific literature, underground photosynthetic communities supported by artificial lighting are called lampenflora. They tend to be made up of cyanobacteria and green algae, although mosses and ferns may also show up as the communities develop over time. Relative to similar communities found at cave entrances, lampenflora tend to be less diverse and produce slightly more chlorophyll. This likely reflects the more stable conditions found underground, including the availability of an unchanging artificial light source. Lampenflora represent a big influx of organic materials into what are often nutrient poor environments, influencing the lives of other cave dwellers. For example, populations of underground-adapted creatures can become threatened by invaders able to better take advantage of the increased nutrient availability. There have been efforts to control the growth of lampenflora, as in addition to messing up delicate cave ecosystems they can damage cave art and are viewed by many as not being particularly aesthetically pleasing. One promising approach is to apply hydrogen peroxide to kill the organisms. Returning to the surface, Père Lachaise Cemetery is the largest graveyard in the city of Paris. It's named for the Jesuit priest who had to listen to King Louis XIV spill the beans on his sins, and is full of famous French folks as well as some annoying guy named Jim Morrison. While enjoying a pleasant stroll between the graves, I noticed many of the tombstones have copper-containing plates and other bits attached to them. They're easy to spot because of the green patina they've developed via oxidation of a thin surface layer (see also: the Statue of Liberty). Copper is widely used in building construction in part due to this pleasing colouration. Another benefit of copper and copper alloys (e.g. bronze and brass) is their inherent ability to inhibit the growth of a wide range of microorganisms. They're increasingly being used in hospitals and other public spaces to kill harmful microbes. Old tombstones often appear to be covered in soot or dirt, when in fact they've been colonized by photosynthetic microbes capable of producing dark pigments such as melanin. These communities are called Tintenstrich, meaning "ink strip" in German. They consist mostly of cyanobacteria, with algae, lichen, and fungi also making appearances. Occasionally, a blackened tombstone will appear to have been poorly pressure washed, with a streak of pristine stone marking the downward path of copper-rich and thus microbially-lethal water from a metal marker higher up. I took a shot of a particularly nice example, but there were plenty to be seen.